A couple of weeks ago I went through all the comments that you wonderful readers have been leaving requesting for certain Persian dishes. I have already fulfilled some of those wishes, but there are 13 of them that still remain. Here is one of the recipes requested! 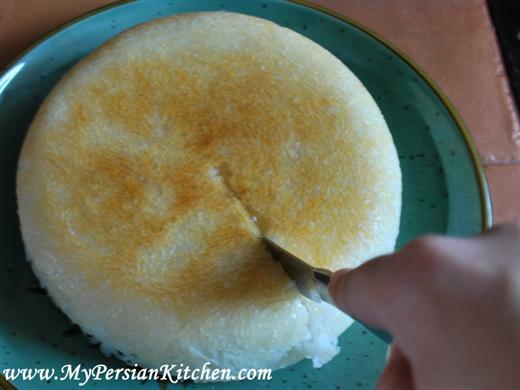 Today’s post is yet another method for cooking Persian rice. 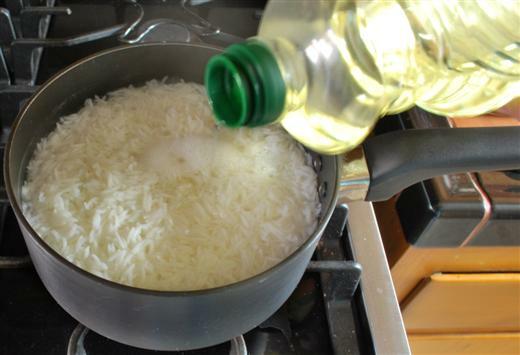 Interestingly, the first rice cooking method that I posted is the most viewed recipe on this site, as of this second, it as been viewed a whopping 4380 times! WOW! Thus far, I have shown you how to make rice on the stove and in a rice cooker. 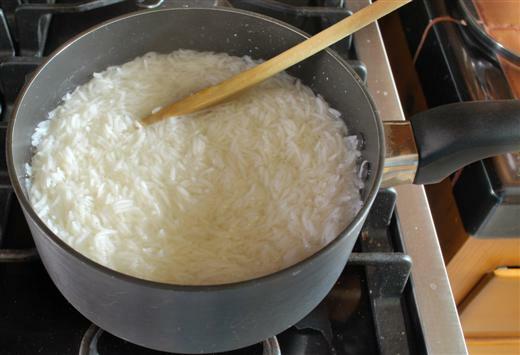 Today, I am going to show you how to make Kateh, which is a much simpler way of making rice on the stove. 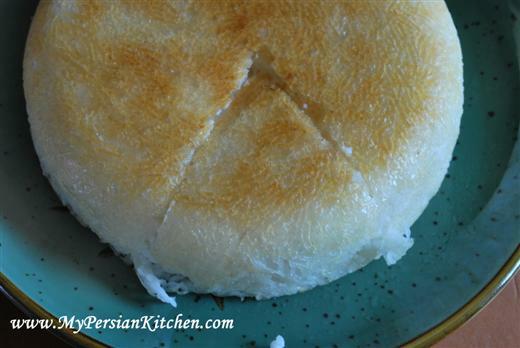 Note that when making Kateh, the rice grains don’t come out all nice and separate. The result can be loosely compared to sticky rice. As always, place rice in a bowl. Wash well until water runs clear. 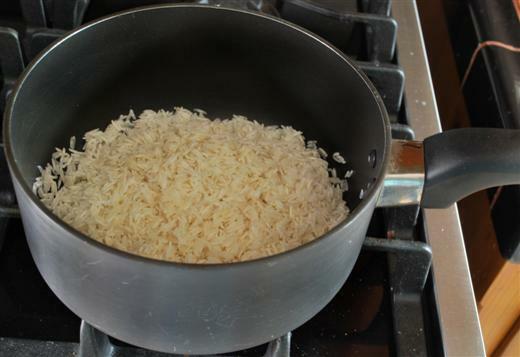 Place rice in a non-stick pot. Here is a little Persian trick that I am so excited about sharing with you. 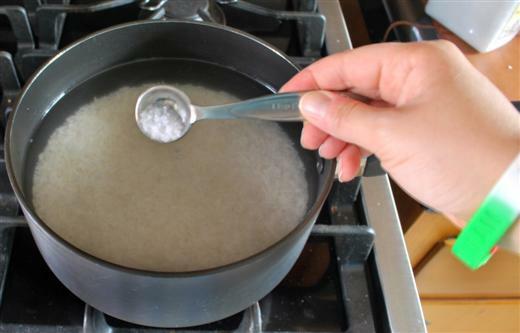 Instead of using a measuring cup, you can use your finger to gage the right amount of water. 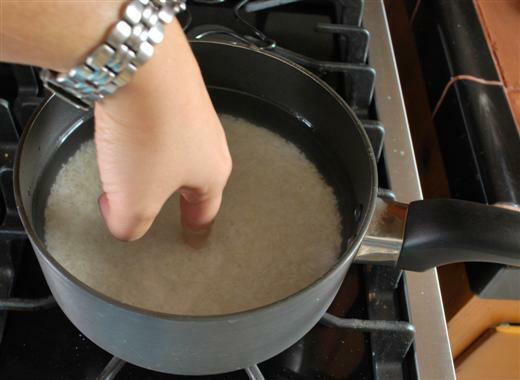 Pour enough water in the pot until it reaches the line at at your knuckle. The water has to be precisely at the line. Here is a closer look. 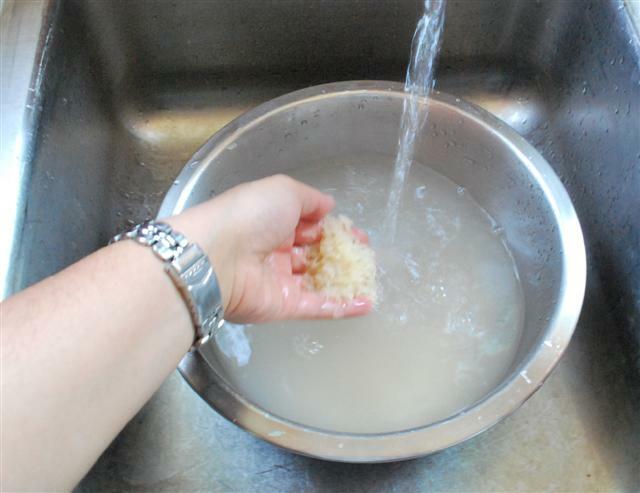 Make sure that your finger doesn’t push down but gently rests at the top of the rice when measuring. 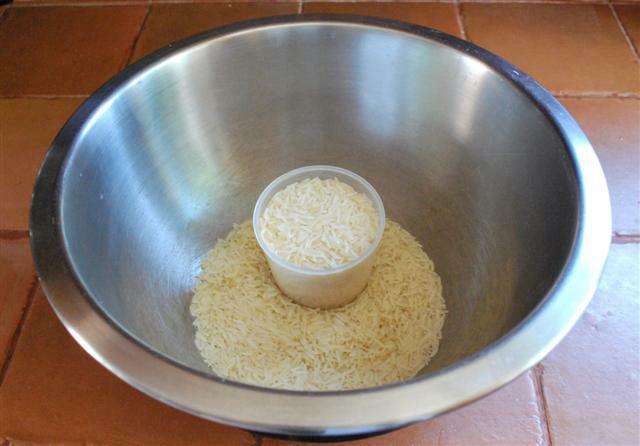 Also, shake your pot slightly to even out the rice before measuring. Alternatively, the amount of water is slightly more than two cups. Mix well so. Cook uncovered until water is absorbed by the rice. At that point add canola oil, I would say about 1 1/2 to 2 table spoons. Cook on low for about 50 minutes. Flip the rice over on a plate. To serve cut through the tahdig. Look at that just like a cake! How do you always get nice tahdig? I’m so jealous. Hi Negar, Practice, practice, practice!!! But seriously, the key is a non-stick pot, generous amount of canola oil, and I also cook my rice on low. Looks great, my friend was telling me how much she likes Persian rice. I like the brown crust and presentation too. Thank you Laurie Lynn! The crust is truly the best part!!!! lovely photos and lovely description. you are so right in what you tell negar- it is practice, practice, practice. yours came out absolutely perfect. Shayma, you are so sweet, thank you!! I love your recipes! do you soak the rice at all? Pilar, You can soak the rice, but you don’t have to. 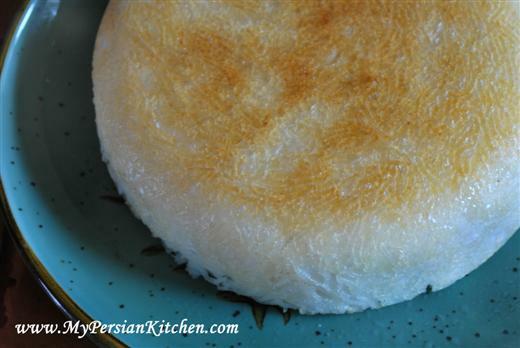 I just wanted to say thank you for helping me learn how to cook so many Persian dishes, including simple things like rice. I miss my mother’s cooking, and you’ve been a tremendous help to me!! Sheila, thank you for your kind words. I can’t tell you how happy it makes me when people leave me comments like yours! I had this rice during a gathering at my Daughter-in-Laws family home. Her Mother waited until we were seated and then she flipped the rice onto a plate so gracefully. I am so glad to see your instructions with pictures. I am a visual learner 😉 Could you tell me what looks like a towel on the pot is for and what is in it. Thank you for this great site. I bookmarked it for other recipes. I can tell I will enjoy everything you post! Anne, thank you for your kind words. 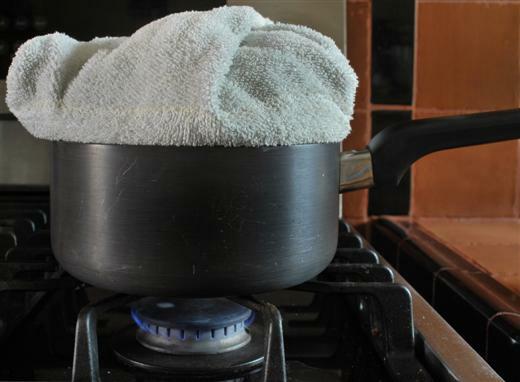 The towel is to absorb the moisture that rices from the rice as it steams so that it doesn’t fall back on to the rice and make it soggy. 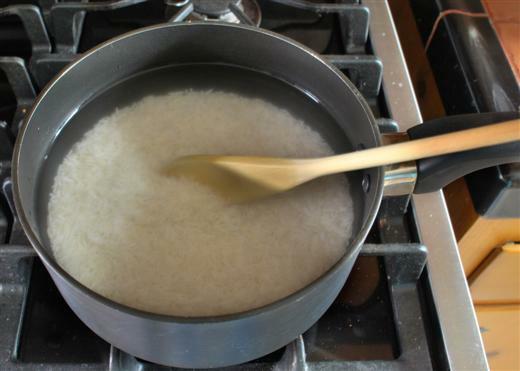 I first boil the water than add rice. i think it is an easier method. I first boil the water then add rice. i think it is an easier method. Sorry, I thought you are a Taiwanese friend who sent me this website. Great recipe. I have a question though, measuring by finger “to the line of the knuckle”, do U mean the third line down on the finger? I’m looking at my nuckles and there are no lines, lol. Please describe and thanks in advance. Ellie, the knuckle closest to your finger nail or the first one from the tip of your finger!